All the documents have to be in English or have to be translated by the Certified Interpreter and duly notarized. This is not an inclusive list of documents required for the Citizenship application. Occasionally, the local authorities might require additional documents or information during the application process. All your information are kept very secure and wont be revealed to any third party. 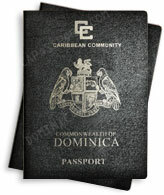 The government of Dominica is very careful and sensitive about this and so Dominica 1st.